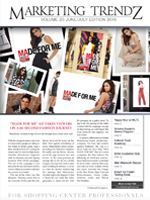 ﻿ Marketing Trendz | Mall Media Inc. Published bi-monthly, Marketing Trendz shows you how to turn demographic trends, consumer research and others’ experiences into marketing opportunities for your center. 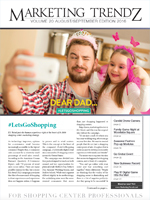 In every issue, you will get the latest retail trends, mall positioning strategies, advertising case studies, insights of marketing experts – and much, much, more! 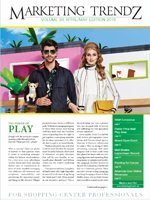 Marketing Trendz is the perfect companion to Tactics Magazine, the global retail real estate news source. 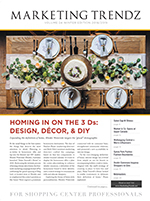 Homing in on the 3 Ds: Design, Décor, & DIY. Expanding the definition of home, Rhodes Waterside targets the “glocal” demographic. Towering over the Competition: The property and marketing evolution of Aventura Mall is an ode to culture, style, and taste. The Gift of Gab: Telling a story through style, Canal Walk Shopping Centre stays local. Touch. Try. Buy. : Stylizing the fails and faults of online shopping, Simon promises the perfect fit at its brick-and-mortar stores. A Matter of Style: Together, Yorkdale Shopping Centre and FashionCAN rack up fashion brands and sales. 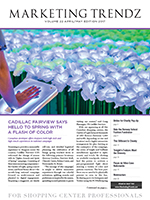 Cadillac Fairview Says Hello to Spring: Canadian developer offers shoppers both high-tech and high-touch experiences in national campaign. Shopping Gets Steamy at Square One: Mall shows off luxe lifestyle and latest lift with leading #RelationshipGoals. JLL Retail puts the human experience at the heart of its shopping center marketing strategy. Manchester Arndale brings Spring/Summer 2016 street style to life with its "MAde for Me" fashion commercial. Enough with the search for a deeper meaning of life through fashion; Bayview village gets real...playful.